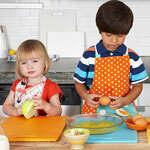 Let Your Kids into the Kitchen – They will Learn, Help & Have Fun! My 5.75 year-old daughter, Julia, has asked to “help” in the kitchen since she was 3 years old or so. Rather than always say no, my wife and I found it best to allow her to enthusiastically help – it may take a little (sometimes a lot) longer and it usually does mean more (sometimes much more) to clean up, but my wife and I find that letting her help in the kitchen gives her pride in participating, which encourages her to eat and there are other lessons learned and quality time spent together. Help measure/scoop dry ingredients (i.e. rice, flour, sugar, salt, etc.) into a bowl or pot/pan or measure/pour (not hot) liquids with guidance from adult. Help “chop” veggies for soup, stew, salad, stir-fry. We let Julia use a stainless steel scrapper/chopper to cut veggies – works well and no sharp dangerous blade. She can make her own PBJ or toast or ham & cheese sandwich – after a couple of times she learned not to put so much peanut butter, jelly or mayo on a slice of bread – learning through experience! Help wash fresh fruits and veggies. Help roll out cookie dough, select the cookie cutters, cut out the cookie shapes and of course decorate. Help empty the dishwasher (excluding knives) and just over the past several months she wants to help rinse and scrub the dishes before they go into the dishwasher! Once Julia was 5, she started helping me make her pasta salad. I would cook the pasta, drain and cool it,but she would help cut a block of cheese into cubes while I would open a can of vacuumed packed corn and bring out the dressing and seasonings. She would help add and mix the ingredients and be the ‘official taste tester’! It’s fun to get her involved and she has pride and ownership in her school lunch for the next day! Regarding the “learning” aspect of kids helping in the kitchen, Parents.Com has the following article which has some good examples! 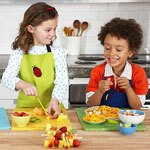 While you’re stirring up soup or making a batch of cookies, let the little ones into the kitchen for some tasty, hands-on learning. Having a pint-size sous chef “helping” you in the kitchen while you’re racing to get dinner on the table isn’t, at first blush, the greatest idea of all time. But your kid will love it, and with a little planning so will you. Will things get messy? Probably. But you’ll be building a foundation for knowledge that will last long after the splatters are wiped away. “Young kids get so much out of being in the kitchen,” explains Mollie Katzen, coauthor of the preschool cookbook Pretend Soup. “They develop dexterity through activities like kneading dough and cracking eggs. And they also get an educational boost in areas such as science, math, and language.” So break out the aprons and let’s get cooking! It’s practically a rite of passage: the baby on the floor pulling all the pots and pans out of the cupboard. Silence your inner control freak! Hand him a wooden spoon, and let him bang to his heart’s content. Cook to the beat, and when it’s cleanup time, help him sort by size, match lids to pots, and put everything back where it belongs. While you’re making a homemade piecrust, bread, or cookies, tear off a small piece of dough and give it to your kid to squish around or pat into her own pretend pie. Even if you’re not much of a baker, why not keep a roll of store-bought dough in the fridge — your child will enjoy creating play pastries and pizzas while you’re busy getting real dinner ready. Set your child up at the sink so he can fill and empty different-size plastic containers — he’ll be learning about the concept of volume. Add small objects like measuring spoons and rubber spatulas so he can guess: float or sink? Squirt in a little dish soap and get scientific: Why do bubbles float? How long will it take before they pop? Pour room-temperature heavy cream into a small plastic tub, leaving it about 1/3 empty. Take turns shaking the container. When you no longer hear a swishing sound, let your child have a peek — you’ve made whipped cream! (A small taste is in order.) Shake some more, wait for a thudlike sound — and voila: a hunk of butter! It will be surrounded by some sour liquid — buttermilk. After you and your kid are done being amazed, rinse the butter in cold water to get rid of the buttermilk. Then it’s ready to eat. Make your child Chief Egg Cracker. Author Mollie Katzen suggests letting kids break an egg over a pie plate to contain any drips. Show your child how to give a good hard thwack with a spoon. Have a damp paper towel at the ready as little kids tend not to like getting sticky egg white on their hands (and raw eggs can contain salmonella, so you want to keep your child’s hands clean as he works). Transfer each egg into another bowl before breaking the next one, to avoid contaminating the entire batch with a rotten one or a wayward shell. Whatever you’re cookin’ up, there are bound to be fractions (“How many quarter-cups does it take to fill a one-cup measure?”), simple calculations (“If we use four eggs, how many will we have left?”), and compare and contrasts (“Which is heavier — the sugar or the flour?”). Another important math skill: creating and replicating patterns. Hello, kabobs! Skewers can be made with fruit, vegetables, cooked meat, cheese. And threading builds fine motor skills (use coffee stirrers to make this safe for all ages). For your budding scientist, the kitchen is a lab where wild chemical interactions result in more than dinner. It’s easy to take it all for granted, but once you start posing questions, so will your child. How does the microwave work so quickly? Why does the soup “move” when it’s cooking and stand still when it’s cold? How come you can smell cookies baking all the way upstairs? Why indeed! Answers to these and other fascinating questions can be found at the kid- (and mom-) friendly Web site exploratorium.edu/cooking. Your kitchen is a hands-on reading buffet. Challenge your child to pick out ingredients from the pantry: “Quick, find me something that begins with the letter P.” Or when she brings you a box of spaghetti have her point out the word pasta. All the while, she’s honing her prereading skills, and you have someone to fetch everything you need to get dinner on the table. Don’t let your yummy homemade butter go to waste. Make sweet and savory mini sandwiches and have a tea party. Ask your child to shake a small bit of salt onto half the butter, then mix with a rubber spatula. Have him spread a slice of bread or a cracker with butter. Top with cucumbers, if you like. Close the sandwich, and if you’ve used bread, have your kid press lightly to flatten. Get fancy by cutting off the crusts or using cookie cutters to make fun shapes. Butter the bread or cracker and add a dollop of jam. Top with banana or other sliced fruit and another slice of bread or cracker. Serve tea or water in fancy cups, and invite a special friend over to share. 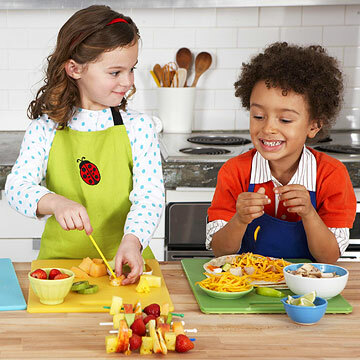 Help your young chef create her own special quesadilla. Once you and your child have assembled the fillings, have her sprinkle (or spread) a tortilla with cheese and then layer with the fillings. A final layer of cheese keeps it “glued” together. Top with second tortilla. Let your kid spray a skillet with cooking oil, then you take over heating on a medium flame, flipping once. Give to your child to garnish. Together use a pizza cutter to divide. Tuck back long hair and wear short sleeves. Keep pot handles turned away from edge of stove. Store a fire extinguisher in an easily accessible spot. Use a butter knife for cutting practice. Have adults take things off the stove and out of the oven, food processor, or blender. Keep all your small appliances unplugged. Originally published in the March 2009 issue of Parents magazine. Letter Tracer Preschool Letters Writing Practice – Cost $.99. Fun way to trace and paint letter and number shapes. The app’s 3 way combination of visually seeing the letter/number, interactively tracing and hearing the spoken voice-over of the letter or number helps your child to learn and retain the alphabet and numbers. There are 3 different modes of play and you can select the voice of an adult male, adult female or a child. 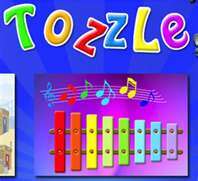 Tozzle – Toddler’s Favorite Puzzle – Lite version is Free and Full version is $1.99. This app is entertaining and educational as it teaches shape recognition and motor skills via drop and drag of puzzle pieces to make the colorful picture whole. When the puzzle is complete, there are sound effects and things your child can tap to animate. The full version provides 35 different puzzle pictures to choose from, all including fun sound effects. Feed Me! – FREE and available in English, Korean, Spanish, Japanese, Chinese, French, Italian and German! 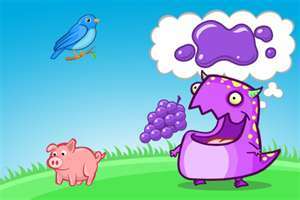 This free app is based on a cool purple monster who has a though bubble filled with a “food” he wants to eat (ie. capital G) and then to the right are 3 options to feed him. Select & drag the right matching food (ie. lower case g) and he gobbles it up and you get trophies for your trophy case! Feed him the wrong food and he gets a tummy ache! The free version provides 26 simple ABC questions. Giraffe’s Matching Zoo – Free and there’s a Deluxe version for $.99. This is an animal fun version of the classic memory card game. Tap a card to have it flip over to see the animal and look for/find the matching card. Full of music, cute cartoon animations and special effects make this a fun way to learn and exercise & stretch that memory! If you have a little math genius, this free app provides a good simple flash card style drill for Addition, Subtraction, Multiplication and Division. 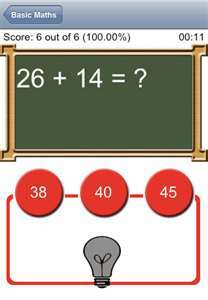 The math problem is there with 3 answers below it, tap the answer and the app keeps score for you. We don’t have a math genius, but find it helpful in learning to count when you are not starting from 1 (ie. 9 + 5 =? So, Julia will start with 9 in her head, hold out 5 fingers and could 10, 11, 12, 13, 14; so 9+5=14). 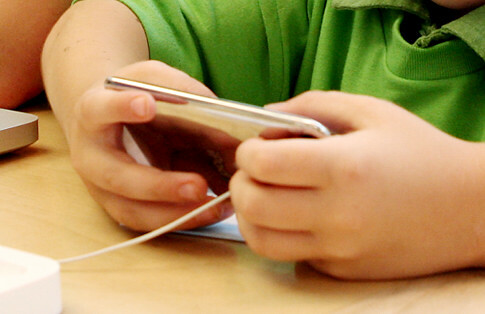 What educational apps do you and your child(ren) enjoy? Please share by leaving a comment. Thanks! And stay tuned for a future post on our Favorite Game Apps for Preschoolers! Our Favorite Kid Friendly Websites! You see, my stay-at-home wife has had enough sick-days, snow-days, rain-days to know, there are moments where she will raise her arms in the air and wave a white flag of surrender. There is only so much crafts, play-doh, pretend play and reading one can do before the dreaded moment arrives and your child looks at you with eyes that say “Whats next?.” Also, add to the mix an infant that the parent has to take care of, in addition to the toddler/preschooler with endless amounts of energy! For some that may mean rolling out their guitar and singing kumbaya, but lacking musical skills, she opt to look to the internet for help. Through the months, we’ve come across these web sites, listed below, that have withstood the test of rain, snow, roseola and an ear infection. My one year old daughter loves this site- perfect for younger kids to toddlers who love pressing buttons on keyboards (who doesn’t?). They have added new things like an alphabet game, numbers, and shapes. Best thing is– no ads! Okay, there are ads, BUT still lots of fun same concept as Kneebouncers but with different themes like “animals” or “marine”. I like that they have categories based on computer skills — like “pressing keys”, moving mouse” etc. The Australian version of “Noggin” has something for everyone, our personal favorite is “Color the Rainbow” and the games from PlaySchool. The children’s area of BBC – this site should be way fun for older kids (3 and up) tons of games with different themes (action and sports, activities and puzzles, animals and nature, etc.). Especially great if you enjoy British humor – case in point, my personal favorite “Cutting the Cheese” , our preschooler enjoys watching “Shaun the Sheep” jumping and falling out of his mattress. Created by a team from Mauritius – this site has a mind-blowing 1,300+ games for kids, with categories ranging from imagination, to memory, listening, and observation – this is one of the most extensive kid’s sites I’ve ever been to. The only problem I’ve had is navigating the vast selection and deciding which way to go, the games we’ve tried so far are easy to understand and fun. I suggest you start by clicking on “Free site” – this page gives you a good overview of what they have. Warning though, they do have ads that seem to encourage kids to click on them, I once had to stop my daughter from clicking on an ad with the Disney Princesses featured, and another time they had ads that were advertising really scary monsters – but no “adult” ads. A classic go-to site with all your PBS Kids shows just a mouse-click away- every show has a different variety of games, stories and video clips. I like showing our preschooler video clips of kids’ experiments from Curious George and she loves playing the A-B-C-D-Watermelon game from “In Between the Lions”. The perfect site for your little nature explorer has everything from how to create a motion-ocean, to games that follow the trail of Captain John Smith. Videos are categorized according to species and are short and interesting enough for tiny attention spans. Our older daughter LOVES this site (when she was 1-3 years old and constantly asked to see it. They have loads of “books” with sounds and simple animations. I joined their yearly membership ($25) and I couldn’t believe how much more you can get access to! She loves the song book “dem bones” and “pirate ship”. I’d place the mouse just-so and after the song/animation plays she pushes the mouses’ right click button and the song starts all over again – it was one of her favorite thing to do. Tessy and Tab is a company that publishes a monthly magazine for kids called “Tessy and Tab” they have a “fun page” with counting, alphabet, and coloring games – but the best thing is their “find the peek-a-bug” game — there is an illustration and the child needs to find the peek-a-bug that is half hidden in the illustration and when they click on it the bug flies away.. its too cute. Last, but definitely not the least, created by the same people who created bluemountain.com – Starfall is dedicated to early childhood reading and is a great resource for games that encourage phonemic awareness. My one year old loves listening the “A” segment. I could go on and on, everyday there seems to be a new site for kids that crop up, some I did not talk about in detail but may be worth a visit are Disney.com, and Fisher Price preschool online. Of course, at the end of the day nothing replaces face-to-face time between you and your child, but these sites provide a good bridge for those times when you don’t want to wedge them in front of the tv (again), but are too exhausted to think up of another interesting activity to do at home. Create a Card Game with your Kid! It’s so simple and fun, all you need is scissors, cardboard or thick paper and a pen/marker. My preschooler liked it so much, she wrote her own cards (phonetically) and we combined both sets. All you need to do is cut the cardboard/paper into rectangles (or whatever shape your kid likes) around the size of a business card and have your preschooler come up with words that you need to act out when you pick that card – it can be verbs like run or dance, nouns like dog or fish, feeling like happy or mad, etc. Write one word on each card and then place all the cards in a bowl and take turns picking a card and acting out the word! After making our set of cards this past Saturday morning, my daughter and I played once right away and then again with the Mom in the evening before bed. Pride of ownership and creating her own game sure beats spending $10-$20 on a board game!